Mountain Goats with stark black horns, white winter coats and reclusive mountain top habitats; make them as spectacular a trophy animal as their picturesque homes! We use a 4×4 truck and quads to access these areas; good condition is a must on this hunt as well as a good pair of hiking boots! 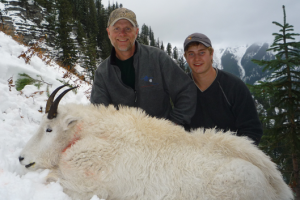 This is a mentally and physically challenging hunt with the amount of hiking involved. Dependent on visibility, weather conditions and the Goats themselves, this adventure offers lots to overcome. We conduct these hunts from our main lodge and set out each day to spot and then plan the ascent up the mountain. At the end of the day you get to come home to all the great food and share your hunting stores around the table. Carrying tags for Whitetail and or Mule deer is a good option. You may be able to spot some walking in the timber while glassing for Goats in the rocks.